You can come to Vegas to drink yourself silly, lose buckets of money and publicly make a fool of yourself in a hundred different ways -- spectacularly unwise choices in bathing suits and chanting, loudly and drunkenly, as you walk through the mall being two of the most popular modes of Vegas idiocy we've seen this visit -- or you can take an hour out of your busy day and go look at aging, rusted out neon signs at the Neon Boneyard Park. 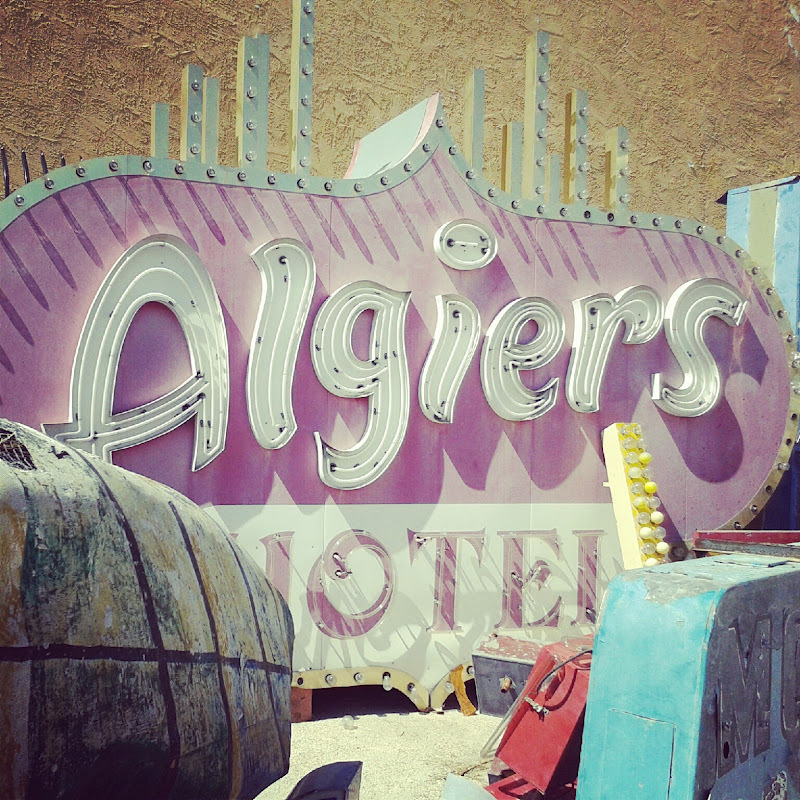 That's what we did -- the aging, rusted out neon signs, that is. One of the best Vegas decisions ever. 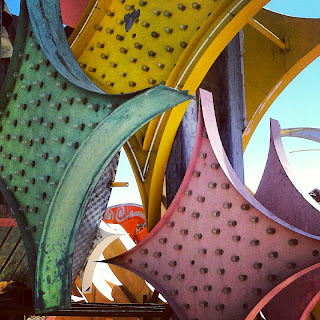 I can take no credit for discovering this quirky little nonprofit museum, which has collected and preserved -- not restored, mind you, but preserved -- many, many of Las Vegas' iconic casino and restaurant signs in a dry, dusty lot just east of the downtown area. Got the tip from The Everywhereist, a most excellent mostly travel blog. I will leave Geraldine to share the down-low on the museum itself -- and jump to why this side trip was so wonderful. We used to stay at this little place in the late 70s -- a little mom-and-pop motor park. We've been visiting Vegas on and off, when the pocket book could afford, for almost 30 years -- my husband's family even longer than that. We REMEMBERED these signs in the Boneyard, we REMEMBERED the casinos -- the Dunes, Sahara, Sands, Desert Inn -- so rich and glamorous in their hey dey, yet razed to the ground without a thought for the uber casino resorts that today seem like small cities unto themselves. 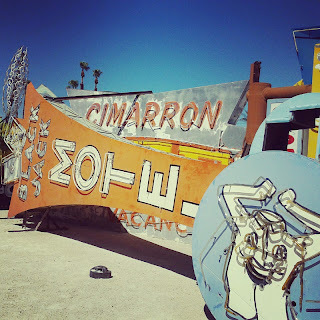 Not to slam uber casino resorts -- we're staying in one ourselves and loving every moment of it. 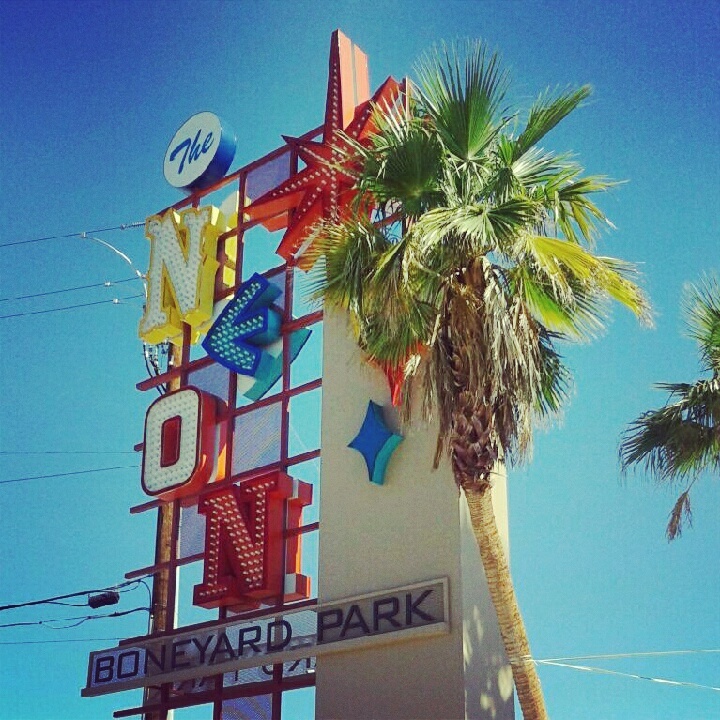 But if you have any history with Vegas, you can't help be haunted by the loss of some of its most timeless symbols and heartened that at least one plucky nonprofit is committed to saving a bit of its soul -- the neon sign. The other piece to why this trip was so wonderful: It's pretty easy to take in Vegas as the Jaded Capital of World because, well, it is. So many -- not all, mind you, not all -- gaming employees, restaurant servers and hotel staff appear numb to flow of humanity streaming through their hotels and casinos. 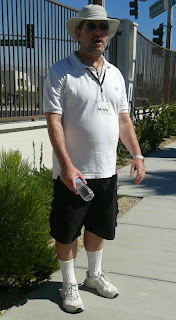 As well they should -- since a goodly chunk of their guests have opted to be boors for the time they spend in Vegas and casino personnel generally get the short end of this stick. The Neon Boneyard volunteers are a stark contrast to the Las Vegasites (?) who deal black jack, take your drink orders and chase down your requests for show tickets. They are thrilled we have come to Las Vegas. They are thrilled we have come their museum. And they love what they do. Despite a posted temperature of 96 degrees at 10 a.m., the volunteers are smiling, milling around offering free bottles of water (donation appreciated) and making wry jokes about filling out their disclaimer. They wear floppy hats and sensible shoes. They are real people. Thank you, tour guide Mitch! They have lives, families and job, and have taken time away from them to share a special passion with us: A city's history and the hundreds of aging, rusted out neon signs they have rescued -- the bright souls -- of Las Vegas.